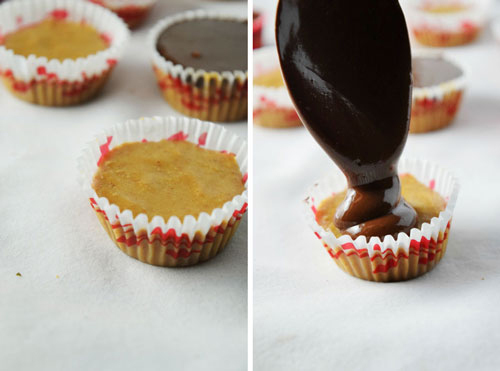 No Bake, Just 4 Ingredients Chocolate Peanut Butter Cups are easy back to school treats! Make them ahead & keep stored in refrigerator! Only 3 weeks before school starts! I know how kids feel about it. Growing up, I never really enjoyed going to school. But I know some kids who wait eagerly for the summer to end and to get back to school routine. But I wasn’t one of them. As summer end would come closer, I would start to feel itchy and would wish that summer would never end. Last month always used to be somewhat stressful with getting stuff ready for school, buying school stationary, getting a haircut, making sure if I had enough dresses for school (we had a dress code which we were required to follow and I feel it used to make the task of getting ready for school way easier as there was no wondering over which clothes should I wear or not as it was a set standard dress and having few sets of those was more than enough). Growing up, I wish I had these treats as it would have had made the task of going through each day much easier. But no worries as I finally made them and they only need 4 INGREDIENTS!! So you know I will keep my fridge stocked up with these all the time. I mean how much simpler can it get. Just 4 simple ingredients : peanut butter, chocolate, graham crackers & butter makes the most delicious bite size NO Bake Chocolate Peanut Butter Cups and they require only an hour of your time and then you can have a good amount of them stored in your refrigerator all the time. Sounds awesome already? You can also play around with your favorite peanut butter flavor.Here I went with my current favorite white chocolate peanut butter but basically any of your favorite peanut butter will work great here! I like making them in small bite size mini muffin cups but you can even make them in silicone ice cube trays and simply pop one out when craving hits! They are an amazing after school/work treats as there are no funny ingredients inside and its like eating something little indulging & mostly healthy at the same time! You know you want these. 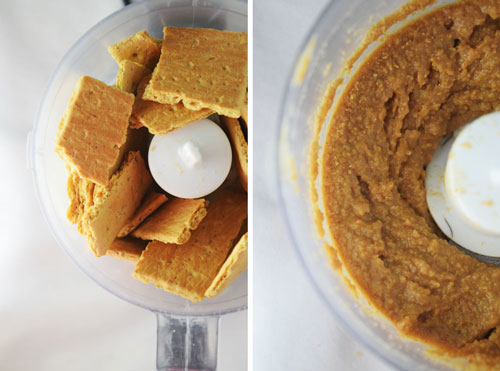 In the food processor, add powdered graham crackers, melted butter & peanut butter and mix until it's all mixed evenly. Fill half of the muffin cups if using with this mix and even them out using a spoon. Chill in refrigerator till you prepare your top layer. Bring water to boil in a pot. Place a clean bowl on top of the pot with simmering water and add chocolate chips in there. Start to move it around with a spatula and you will chocolate will start to melt in few minutes. Add peanut butter, starting with 3 tbsps and you can add more if you want more intense peanut butter flavor. Mix it all until all the chocolate & peanut butter is melted. Remove the bowl from top of the pot and fill the remaining half of the muffin cups with this chocolate mix. Now quickly melt some peanut butter in microwave. Add few drops of melted peanut butter on top of one muffin at a time and using a toothpick or knife, make swirls around. Repeat with the rest and pop them in refrigerator until chilled for 2-4 hours. Store in an air tight container in the refrigerator! 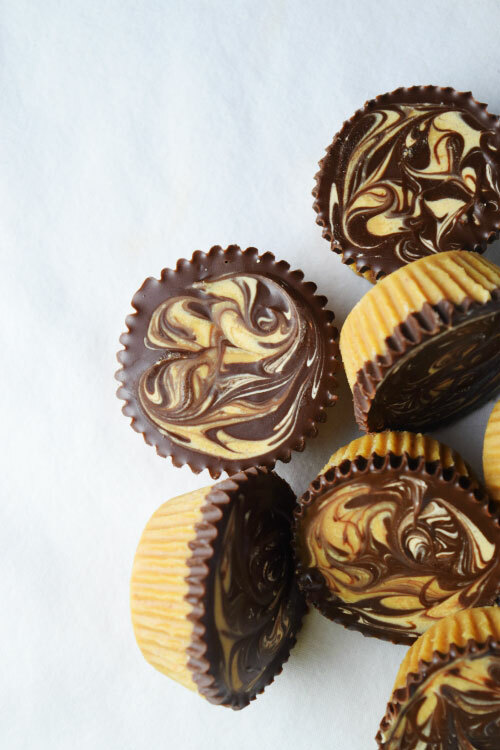 Ami, these peanut butter cups are just calling my name! I love that they’re no bake and contain just a few ingredients! I think I would have no willpower and would eat the entire batch! I love these Ami, well you know I am obsessed with PB so I’m crushing over these and no-bake is always fun! I wish someone gave me these to snack on when I was in school! :/ Pinned! These looks so cute, not to mention yummy! The only thing that used to get me excited for back to school was all the fun school supplies…I love that stuff! But these PB cups could get me pretty excited, too, they look delish! oh yes how can I forget that?!! I used to have dreams that I own pencils & erasers filled rooms! How crazy is that but I am like you when it comes to cute stationary!! Oh, dear. Oh, dear, I wish that was in my mouth right now. I have seen no bake peanut butter cups (usually in far form) a million times but never actually considered making them. I am now considering making them. 🙂 No added sugar and so easy! Excellent! Aww your comments always brighten my day Erin!! I hope you try these. I am loving them as an evening pick-me-up sort of snack! 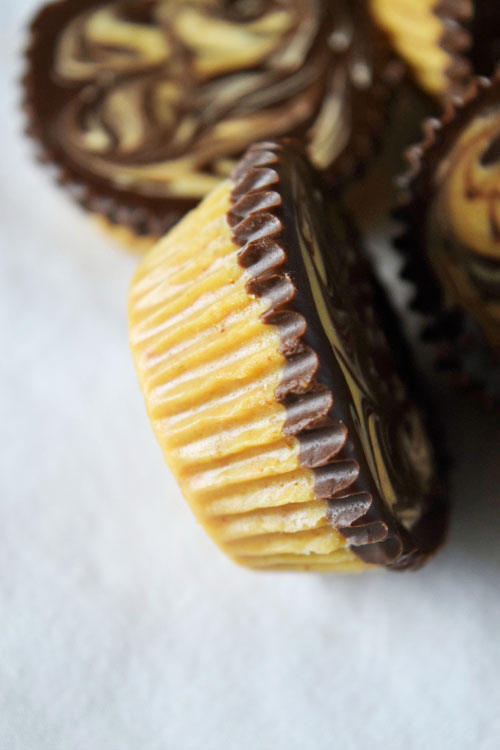 Peanut butter cup recipes are all over the web right now. I just posted a PBC energy bite last week. 🙂 These are beautiful, Ami! Thanks Linda! Aww I hope you are feeling OK..I don’t have kids yet but I can understand how hard it gets for parents when their kids start going to college, moving to other place to study n all. Total comfort food! You just can’t beat peanut butter and chocolate! OMG ! I love chocolate peanut butter cups. I used to get these from trick or treating when I was a kid 😉 Thanks for sharing this lovely recipe. These would definitely have to be hidden from me… They’re so pretty, too! These Peanut butter cups looks delicious, Ami. Oh sorry! Actually, they look droolicious! I wish I could have 3 or maybe 4 of these beauties right away! YUM! I love the ration of peanut to chocolate, I always get the kind sized Resse’s cups to get more PB with my chocolate, and your are perfect! I love how easy these are to make and that swirl on top looks SO good. I can’t control myself around anything that is peanut butter related. I can’t believe how soon school is starting already too! 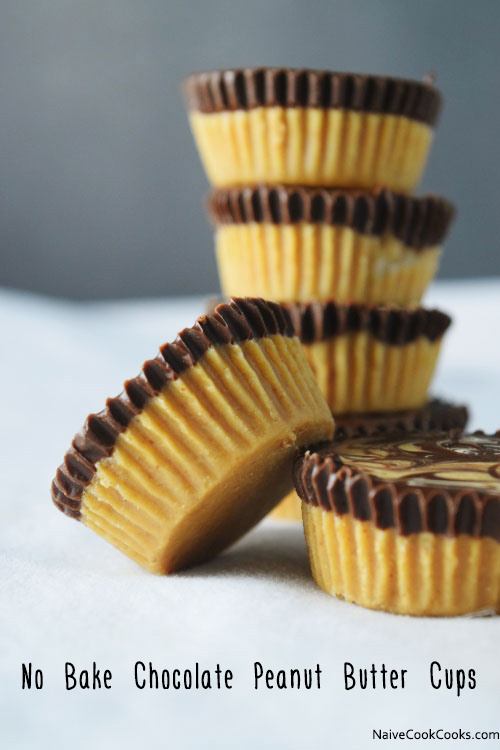 These peanut butter cups would make delicious snacks! They look amazing, Ami! Love that they are no-bake too! These are adorable! I have a weakness for peanut butter and chocolate, so these have no chance of staying around too long! Like this idea. 2 questions B4 I make these: 1) If I only have unsalted PB, how much salt would I add, & 2) Can I sub an equal amount of cacao bits? Thanks so much for all your time & energy in making life more beautiful! You are a lifesaver for people with special dietary needs. I found you only a short time ago & I have made 6-7 of your recipes but have yet to comment, though I have shared everything with family & friends who have grown to love you too! When I can breathe again (I suppose after Christmas) I promise to critique every recipe that I have made because they are soooo good! Your granola bars will forever be a staple in our home. I made a modified version of this recipe. Instead of mixing in the graham crackers, I made a graham cracker crust for the bottoms. (5 graham crackers, 1tbsp brown sugar, 3 tbsp butter combined in food processor, pressed into cups then baked at 350 for 5 min). To thicken the butter/peanut butter mixture I added 1/2 cup powdered sugar and 1/2 cup flour. I also used bittersweet chocolate chips, since that’s all my grocery store had! They turned out great! I froze them overnight then took them to work. Looks delicious! Had a query. Any idea, in India, what can you substitute for Graham crackers? Looks yummy. Will try out soon. What can i subsitute for peanut butter, my kid aint really a fan of it. well you can substitute almond butter! How many does the recipe make? only 15? Have you tried Coconut oil in place of the Butter? Hi Tammy! Actually I haven’t tried but can’t see why coconut oil won’t work in place of butter. Do report back if you give these a try! I was wondering what I could sub in for butter, since I can’t eat dairy. Some things work great with a stick margarine and in some of my cake frostings I use non-hydrogenated (veggie) shortening too. I’d like to know how the coconut oil worked if anyone tried it. Oh my stars this writing is so tiny, I probably made a million typos! Please forgive! i’m curious as to how the graham crust forms into the muffin liner to get that nice shape. Anytime I’ve worked with Graham crust it has to be packed in but with a liner I wouldn’t be able to do that. Unless the crust is not that firm and it just settles into the liner? Yes Chris unlike other graham cracker crusts, this is very soft and pliable so once you add it inside the muffin liners, as it hardens it takes the shape of the liners 🙂 Hope you give these a try! Peanut butter with no bake sounds interesting! One question, can I use almond butter instead of peanut butter? Yes sure!! Let me know how it turns out!